Description: The power for the Charleston Turn rests by day and works by night. Description: Switching in the Dillerville yard. Description: Look north on this track and this is what you see. Description: The parking lot afforded some close-up views. Description: NS GP38-2s 5652 and 5659 along with SD40-2 3419. Description: Cedar Street crossing. En route to the Humboldt Industrial Park. 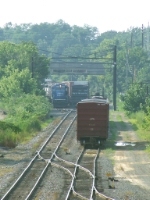 Description: Former Conrail locomotives doing a push-pull. Description: H97 pulls forward after switching an industry. This job has a pair of Conrail SD40-2s today (10:44AM). Description: Backing up to switch another customer in the Humboldt Industrial Park. Description: Pulling forward after picking up some empties. Description: After setting off its train, H97 moves east to pick up some more cars to be switched.